are an accident waiting to happen…. Welcome to Skyhook GB, the home of cable hooks. We are the original, first to market developers of high quality, innovative, cable safety products in the UK. Slips and trips are the most common cause of injury at work, on average accounting for 40% of all reported major injuries. Trailing cables are one of the main tripping hazards in the workplace and with our help, the easiest to safeguard against. With its unique patented design, Skyhook Cable Safety System is the simplest, most effective way to safeguard against tripping hazards caused by trailing cables in the workplace. 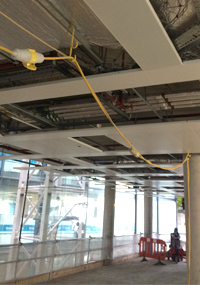 The Skyhook™ cable hooks system is extremely simple in design yet incredibly effective and has been warmly welcomed by the Health and Safety Commission. The Skyhook™ unique design enables the user to attach it to almost any material anywhere in the workplace. 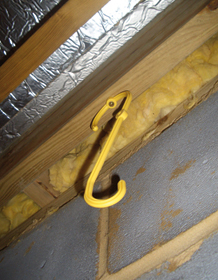 Featuring a large loop, this enables it to be hung from ceiling grids, joists, scaffold poles and doors, and in addition there are two small holes to enable overhead fixing or wall fixing using a small screw. 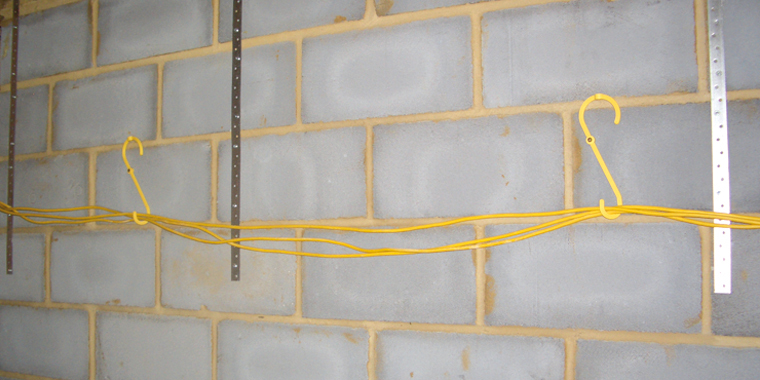 The unique offset or ‘twisted’ form of the Skyhook™ enables it to be attached to a wall, while the loops stand proud, allowing easy attachment of cables. Since launching our original cable hook support system, we have extended our product offering with the additions of multi-hook and extendable tower stand support systems, as well as developing the Skyhook™ Medi for use in the Healthcare industry. Today we sell our Skyhook support systems to over 150 companies throughout the UK and overseas, including some of the biggest names in the construction industry.